Sterling mantel clocks have visionary designs. Sterling constantly works to uncover the styles of the future while revitalizing themes from the past. They challenge mantel clock convention in the search for elements that fill emotions with feelings of nostalgia, tranquility and inspiration. Sterling mantel clocks foster an unrivaled array of quality, innovation and design. 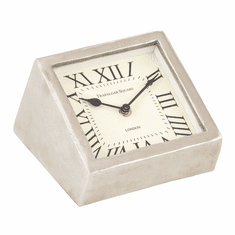 Simply Mantel Clocks is proud to offer the full line of Sterling mantel clocks. Welcome to inspirational living, the Sterling Mantel Clock way! 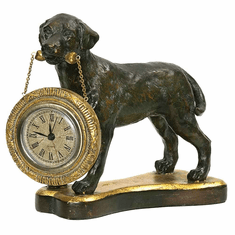 Among our top selling Sterling mantel clocks are the Labrador mantel clock, and the clever Globe mantel clock. All of our Sterling mantle clocks come with free shipping and our 30-day money back guarantee. We invite you to experience the Simply Mantel Clocks difference today. Sterling mantel clocks (also referred to as a "mantle" clock) are available in a wide range of styles and prices. There are many things to consider when purchasing a Sterling mantel clock. For instance, the look. Every individual mantel clock page includes specific descriptions. You will want to ensure that the Sterling mantel clock you purchase will fit nicely with your decor. Every Sterling mantel clock has a quartz movement. This means the mantel clock runs on batteries and requires no winding. Check the individual clock product page for details on features. At Simply Mantel Clocks we offer the guaranteed lowest prices available on Sterling mantel clocks. We can do this because we are an authorized Sterling dealer. 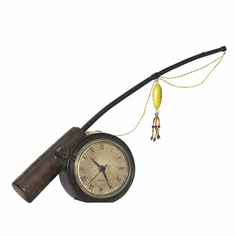 And unlike many other non-authorized dealers, we back every mantel clock with a 30 day guarantee. Let us help find you a mantel clock that will become a treasured family heirloom for years to come.